Few realize the extent of dogfighting in the U.S including my old self. Only recently did I learn that there are 40,000 professional dogfighters and 100,000 street dogfighters in America. (This is based on the Humane Society’s estimates which other groups normally cite). Now consider how many dogs each dogfighter touches. This “sport” is horrific and behind the curtains it is thriving. According to NPR contributor, Monica Villavicencio, dogfighting as a sport can be traced back to 43 A.D. when the Romans invaded Britain. Both sides used fighting dogs during the seven-year war. Thereafter, a canine-fighters market emerged. The Romans began to import British fighting dogs – which were considered more ferocious than their Roman counterparts – for not only wartime but also public amusement. In Rome’s Colosseum, hordes of people would behold the spectacle of vicious dogs pitted against other animals (even wild elephants). “Vicious” British dogs were crossbred with Romans’ fighting breeds and then exported to other European countries. 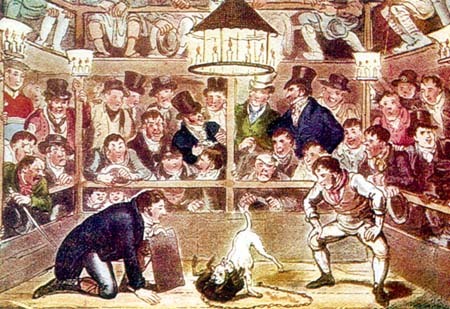 Following the outlawing of bull-baiting in the UK, fighting dogs were imported to the US and the abhorrent spectacle became quite popular. I wish I knew more about the campaign against dogfighting in the 19th century, but I did uncover a few interesting facts. First, from 1800 to 1860 information pertaining to dogfighting was actually published in the Police Gazette (the same tabloid that listed the latest crimes and police news). While concerns about humaneness were raised and law passed, there was still a great deal of public support for dogfighting. Henry Bergh, the founder of ASPCA, was disgusted with the sport and successfully lobbied for the practice to be banned. In 1868, Kit Burns was the first to be arrested on dogfighting charges. He ran one of the largest dog fighting pits in New York called “Sportsmen’s Hall.” Though his charges were later dismissed, after his arrest the “sport” was driven underground in secret locations across the country. Fast forward to the 21st century and the sport is still operating at full speed underground. While we are witnessing (or creating?) a cultural shift vis-a-vis our relationship with dogs and increasingly categorizing pets as family members, dogfighting – especially on the streets and among gangs – is on the rise. New forms of “entertainment” like “trunking” have arisen. Two fighting dogs are thrown in the trunk of a vehicle, music is pumped up so loud that no one can hear them scream, and the driver keeps driving until the yelps are no longer. Pit bulls are the most common victim of not only dogfighting, trunking, and animal cruelty, but also breed specific legislation, reckless backyard breeding, and owners who give up their dogs due to apartment bans, money concerns, or any number of excuses. (I may be imposing my moral standards on dog guardians… While not all people concur, I believe once you decide to take a dog in [unless you are fostering him/her] you should commit to forever – just as they do). If you don’t want to read any graphic details, skip to the last two paragraphs where you’ll see how you can help in one little (potentially big!) way. The cruelty that dogs face begins far before the fight. Dogs who are used for fighting are kept penned or chained (with heavy chains), often close enough to other dogs to increase agitation but not close enough to touch. They may be taunted and starved in order to trigger extreme survival instincts and encourage aggression. Ears and tails are cropped to prevent other dogs from latching on in the fight. Dogs who win fights are forced to fight again. Dogs who lose may die in the ring, be abandoned, or tortured for “failing.” The losing dog may be burned to death as punishment, body parts hacked off, dragged behind a car at high speeds, or killed in other sadistic ways. Dogs unwilling to fight are often used as “bait.” Bait dogs have their mouths taped shut and are tied down helpless. In addition, dogfighters often pick up dogs (or cats and rabbits) on the street or collect “free dogs” from Craigslist to be used as bait. 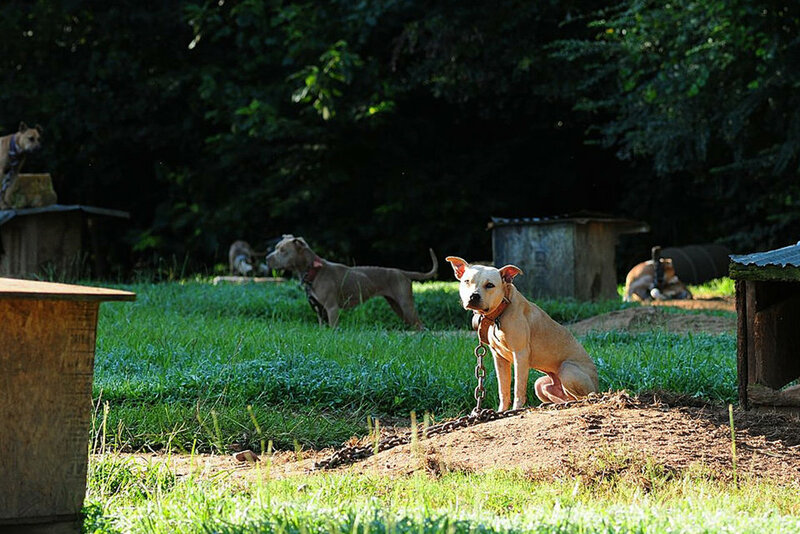 Community tips are among the chief tools law enforcement teams have to uncover dogfighting cases. The Humane Society will pay up to $5000 for information leading to the arrest and conviction of a dogfighter. The tip line is 1-877-TIP-HSUS. 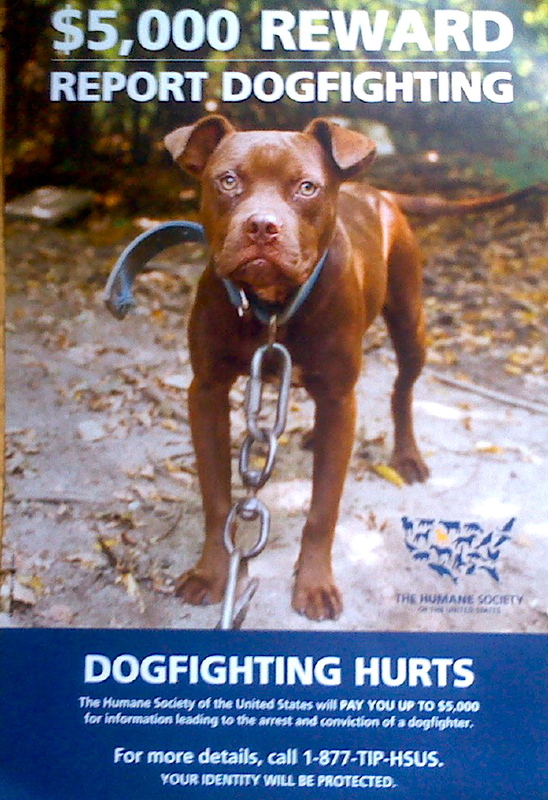 If you are willing to support the cause and maybe, just maybe save one or more dogs from enduring a torturous life, email crueltyresponse@humanesociety.org for FREE tip-reward posters to post in your community or where you suspect it may be occurring. Mine came in the mail a week ago. See photo below. Vafa Animal Shelter in Iran & Austin Pets Alive! … Sister Shelters?